MANILA, Philippines – When the former Mayor of Titay, Zamboanga Sibugay and now incumbent Board Member Maria Esperanza Corazon Rillera received turtle eggs as ‘pasalubong’ from her husband who had gone to the Turtle Islands in Tawi-Tawi, she was so happy about it that she shared photos on her personal Facebook account. 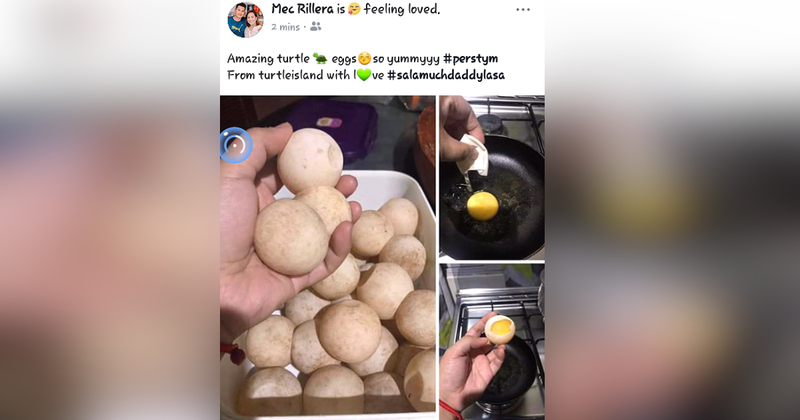 The former mayor shared three photos in a post where she bragged about the turtle eggs being ‘so yummy’ and admitting that this was her first time to eat the treat. 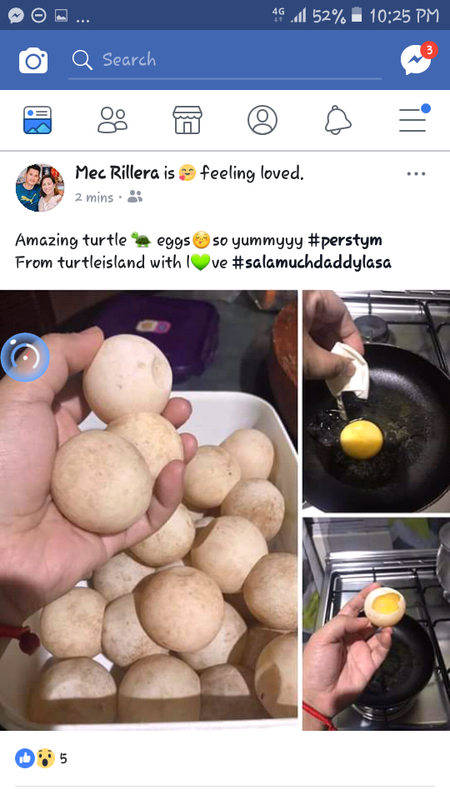 But though Rillera loved the taste of the turtle eggs and was ‘feeling loved’, many netizens were not happy with her post. In fact, many netizens were angry that she cooked and ate the turtle eggs, telling her that this was actually against the law! The post was re-shared by several Facebook pages, including the Pinoy Naturalist Journal, page about Philippine wildlife and natural history. All sea turtles and their eggs are protected by law, but massive poaching still occur in Turtle Islands. Illegally collected turtle eggs are transported/traded in various places including Zamboanga Sibugay. We urge #PNPCIDG, #PNPMG #NBI environmental crime unit, #DENR #BMB, #DILG and LGUs to investigate the continuing assault on Philippine wildlife. Realizing that she made a huge mistake, Rillera has since taken down the post but netizens were able to take screenshots they shared on Facebook. Many called for Rillera to face the legal consequences of her actions. “Green sea turtles (Punnu) are classified as endangered. For collecting of turtles, by-products (eggs) and derivatives (carapace), the penalty is imprisonment of one (1) year and one (1) day to two (2) years and/or a fine of Two thousand pesos (P2,000.00) to Two hundred thousand pesos (P200,000.00) if inflicted or undertaken against endangered species. This is based on RA 9147 or the Wildlife Protection Act. Enforcement of this law is major challenge,” a netizen shared. Some netizens and supporters called on other netizens to stop bashing Rillera, saying she surely had no idea that she had just done an illegal thing but others pointed out that ignorance of the law excuses no one – and she should know that because she had studied law at the University of the Visayas – Gullas Law School, according to her Facebook profile.